Chicken paillard with lemon salad from Healthy Life For Me is a healthy meal that will help you maintain your new years resolution goals. Boneless skinless chicken breasts are simply seasoned with garlic, salt and pepper and cooked with minimal oil until golden brown. It is served next to a bright and citrusy salad composed of a mixture of arugula, spinach, and grape tomatoes. Feel free to add other veggies to the salad. Combine lemon rind, juice, oil, and garlic in a large bowl. Sprinkle with ¼ teaspoon salt and ¼ teaspoon pepper. When ready to serve add arugula and toss well, making sure to coat leaves evenly. Place each chicken breast half between 2 sheets of heavy-duty plastic wrap; pound each piece to ¼-inch thickness using a meat mallet or small heavy skillet. Sprinkle both sides of chicken with remaining ¼ teaspoon salt and remaining ¼ teaspoon pepper. You can do this earlier in the day and cover and refrigerrate if needed. Heat a grill pan or a large nonstick skillet over medium-high heat. Coat pan with cooking spray. Add chicken, and cook for 4 minutes on each side or until done. Remove chicken from pan, and keep warm. 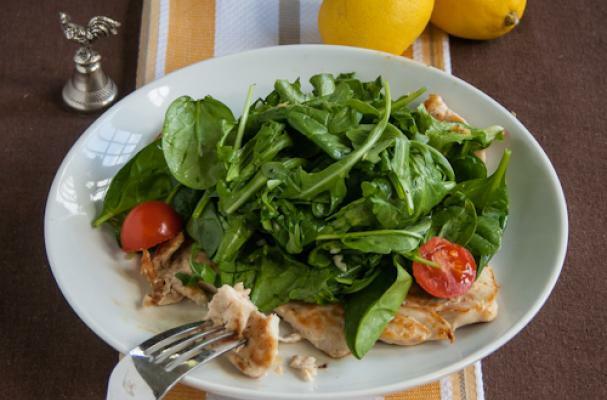 On a plate, place one chicken breast top with a heaping of salad and top with a handful of tomatoes.